Brooklyn has become ubiquitous. A little over a year ago, GQ magazine named the borough the coolest city on the planet. The PLANET! Young creatives in Paris and Stockholm are reportedly trying to recreate its carefully curated patina. Here’s the thing: the majority of these shout-outs focus on very specific areas, namely northern neighborhoods like Williamsburg, Fort Greene, Cobble Hill, Park Slope and Prospect Heights, among others. And you can find plenty of guides to those areas. But they make up only a small fraction of the borough, maybe 25 percent. There’s a world of Brooklyn left to explore, and it’s not glossy newness that makes it inviting. Just the opposite, in fact. Coming here is the equivalent of taking a time machine to a 1970s USSR, if the Soviet Union at the time was filled with overflowing supermarket shelves and tacky Roberto Cavalli. I love Oceanview Cafe and Cafe Glechik for pelmeni or vareniki–Russian- or Ukranian-style dumplings–tossed with butter and fried onions and topped with a hefty spoonful of sour cream. Add herring with red onions and buttery boiled potatoes and wash it all down with a glass of compote. Nearly every place in Brighton is blissfully BYOV (vodka, natch). The boardwalk is lovely, too. Elderly Russians love the sun (maybe because it was so scarce where they came from?) and congregate on benches, gossiping or playing dominoes. These scenes make me happy. 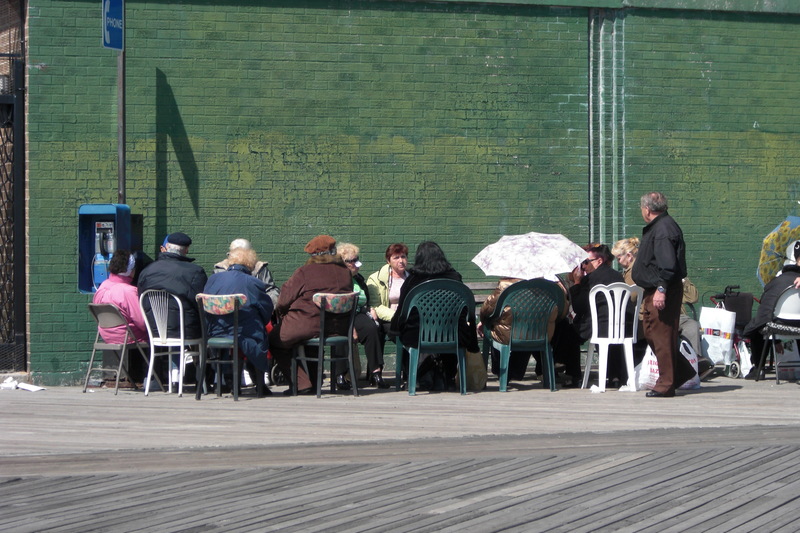 If you’re going to eat on the boardwalk, try Tatiana Grill, but keep in mind that all of the eateries will be overpriced compared with those on Brighton Beach Avenue one block over. KeBeer, precariously positioned in the vast, in-between haze that separates Russian and American cultures, is a good place to drink some beers after you’re done beaching (though I’d stay away from any non-Russian eats). If you’re taking provisions home, I really love the variety at Brighton Bazaar. Pick up a vobla–a dried, whole fish–take it home, smack it against the table a few times, pick at its innards and wash it down with a pint. The only time my mother drinks beer is when she eats vobla. True story. Flatbush Avenue and its surrounding streets have a buzz that’s hard to match. On a recent Saturday afternoon excursion, I ventured to guess that it was one of the busiest streets in the city at that precise moment. The neighborhood is filled with immigrants from the Caribbean Islands, and with them they bring some of the best examples of the region’s specialties. Roti rolls are commonly consumed in the West Indies and can most succinctly be described as Indian- and Caribbean-ingredient-filled burritos wrapped in a “roti” or naan-like pancake. Not, very succinct, I’m sorry. I loved my curried potato roti at Trini vendor Rama’s Roti Shop. Jerk chicken is another specialty, and while I’m not entirely familiar with specific restaurants, the Village Voice did a recent best-of roundup. An old Italian neighborhood that is at once familiar and new. Parts, like 18th Avenue and surrounding environs, seem like they haven’t changed in decades. (I can attest to that. I lived there 25 years ago). 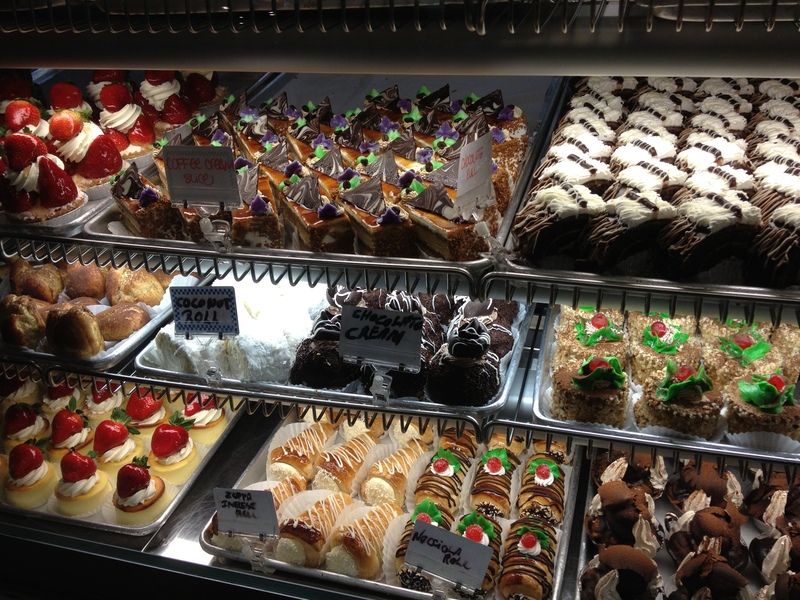 Head to Villabate Alba for delectable Italian/Siclian pastries like cannoli, sfogliatelle and ricotta mushrooms. Feast your eyes on special occasion cakes in a variety of colors. A sign stating that they import their ricotta directly from Palermo, Sicily proves they mean business. Nearby, Royal Crown Bakery bakes some of the best bread in the city. Their chocolate bread, only available on Saturdays and Sundays, is worth an early weekend wake-up. Asian immigrants have been moving in over the past decade, bringing a slew of new businesses. Though technically in Dyker Heights, nearby East Harbor Seafood Palace is a great place for dim sum. Though technically part of Flatbush, this neighb has developed an identity all its own, slowly transforming into a northern-Brooklyn transplant with the addition of a few NY Times-reviewed restaurants on Cortelyou Rd. Among the options are a new-American restaurant (The Farm on Adderley), a flower store that doubles as a bar (Sycamore), a modern Filipino restaurant (Purple Yam), a stellar hummus place (Mimi’s Hummus), a wine and small plates bar (The Castello Plan) and a closet-sized gourmet market (Market), with more establishments on the way. Walk the Victorian section for your own escape to the ‘burbs. These quite streets are scouted by NYC-based movie and TV projects to represent small towns and leafy suburbs. Nearby Ocean Ave. is a hodge-podge of ethnic shops and restaurants. Bay Ridge feels like its own distinctive city, with bustling avenues of shops, apartment as well as expansive single-home dwellings, and access to a lovely waterfront with views of the Verrazano-Narrows Bridge and across-the-bay Staten Island. Popular discount retailer Century 21 has an outpost here, and Tanoreen, one of the best Middle Eastern restaurants in the city, has called the neighborhood home for 15 years. Try the eggplant napoleaon and save room for a knafeh, a mesmerizing combo of shredded filo dough, cheese and syrup. One of my favorite things to do is visit to the beach at Coney Island on a cold winter day. Bonus points if it’s snowing. You’re in New York City, yes, but you feel as though you’ve discovered an abandoned amusement park at the end of the world. Unless there’s a Polar Bear Club meeting, you’ll most likely have the place nearly to yourself. 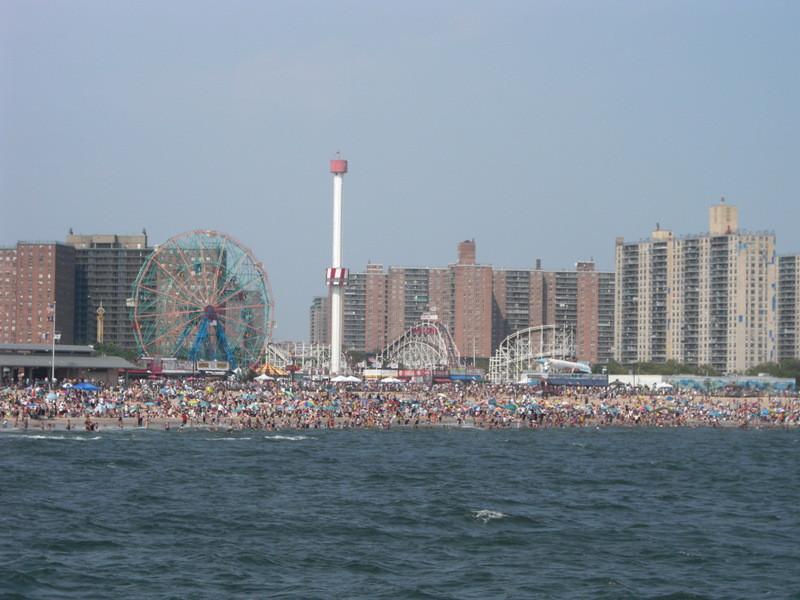 Which is not to say Coney Island isn’t a great destination during the summer. Catch the eccentric Mermaid Parade, or make a day of it with a visit to the recently reopened Totonno’s and a minor league baseball game. The Brooklyn Cyclones’ stadium is right on the water, and each Friday and Saturday evening game is followed by fireworks. Luna Park, a new theme park abutting some older rides, features a few modern, pint-sized roller coasters. If you’re into those kinds of thrills, be sure to ride the Cyclone, which seems not long for this world. The rickety, feels-like-it’s-going-to-fall-apart-at-any-minute wooden coaster will send you flying in every direction and leave you with a few prized bruises. Located south of South Slope and Greenwood Heights, Sunset Park is a vibrant neighborhood with a large population of Central and South American as well as Asian immigrants. The park that gives Sunset Park its name is fairly small and unassuming, but it features a lovely view of lower Manhattan. Debates about the best tacos in the neighborhood are never–ending. Eighth Avenue is filled with dozens of delicious Asian spots. To burn off all of those calories, head to Melody Lanes, a laid-back and inexpensive throwback bowling alley with a famous bartender.